Canon IP4300 Test Page - What Does It Mean? Discussion in 'Canon InkJet Printers' started by FTD, Jan 19, 2015. I have a IP4300 that is several years old, and has been sitting unused for about six months. Foolishly, I let it sit rather than printing an occasional page or two. I left the cartridges in the head thinking it would be best to keep ink from drying on the screens, but drying of the ink in the heads caused some blockage as seen in the pattern on the first test page I posted. To try and open up the heads I soaked the head in warm water for a few hours with little success. I then tried resting the print head on a Windex soaked paper towel, and adding drops directly to the screens repeatedly as it flowed through. After about two hours I rinsed the head with water and tried printing again. The pattern improved greatly, but there still are a few lines missing on the grid pattern. I repeated the Windex soaked paper towel twice, first for two and then about four hours... no improvement. What I am wondering is what the pattern shows? No matter how many test pages I print, or ink cleanings I run, the pattern is always the same. So does this mean a single specific jet is blocked, or since there are four lines missing that four jets are blocked, or does it mean something completely different? In general if I print a text test page it looks O.K., but there is occasionally a dark line in the other colors (for example if I print the Google home page there will be a thin dark line running through "Google"). In addition, now after each print I hear what sounds like the cartridges purging. I don't remember that happening so frequently before. EACH horizontal line represents one nozzle. So four nozzles are "at issue". 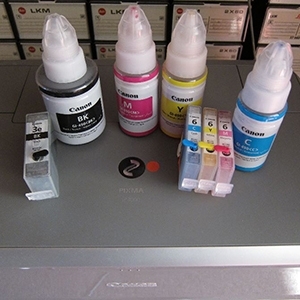 You may still have clogged nozzles in the Pigment Black ink grid. OR, those nozzles have become inoperative. Good to see that light cyan recovered. Soak it longer, it will clear up if the nozzles are undamaged. I would tend to agree with @turbguy and @Smile but I would also look into getting some new or replacement cartridges.. This is from a recent post. I had problem with pigment black being inexistent in the nozzle check pattern, I have seen this inexistent problem twice and this is what I did. Now your problem is not so bad as some nozzles are the ones with the problem. This could be helpful assuming that your pigment cart is Ok with no flow problems. My failure proof method is to boil water, (not in the microwave), place the printhead horizontally so the nozzles are facing to you,(for some precautions I covered with toilet paper the openings above the inlet ports this in order to avoid water or steam wetting the printhead board) and then you fill any syringe (a 50 or 60 cc is better for the time you keep spraying water on the nozzles, remove the needle to fill it then attach the needle, this way you avoid long wait time filling and the water is still hot ) and pour the content on the nozzles of pigment black in a sweep and slow motion from top to bottom. Also with the same syringe spray water in the inlet port and the purge pad. (Only boiling water cleared the filter in the purge unit without removing it). It is important to apply great pressure to the plunger to make this more effective. I think this is the principle of pressure washer which loosens the pigment particles in the nozzles with pressure aided whit hot water. I am pretty sure this won´t fail. Perfect nozzle check guaranteed. Thank you all for the replies. I had loaded new cartridges after I cleaned the head the first time, so I should be good to go there. I will try the power washing, and if it doesn't work, let the head soak for awhile. Please don’t be tempted to let boiling water anywhere near your print head or your cartridges because it will damage them both, you can however use hand hot water safely.. Smile, jimbo123 and PeterBJ like this. I've gone higher temp than "hand hot" w/o issue. The almost boiling water was only at the nozzles, nothing above. Not going to claim that the very hot water was the trick, but we all know most chemical reactions, i.e. destruction of molecules, is hastened at higher temperatures. Granted, I didn't put a thermometer in the water, so maybe "almost boiling" was a bit of exaggeration. It was microwaved until "sorta steamy"? If you've ever had a rapid response thermometer in some water, especially of not much volume, the temperature falls extremely rapidly. So, just carrying those few ounces of water from the microwave to the counter, and by the time I put the head in, it surely lost 15-20 degrees..........from wherever it was.